This three bedroom terraced is located in close proximity to the Milton Keynes General HOSPITAL and boasts a REFITTED KITCHEN, CAR PORT, DOWNSTAIRS CLOAKROOM and three DOUBLE BEDROOMS. Further benefits include a PRIVATE REAR GARDEN and is to be sold with NO UPPER CHAIN. Doors to cloakroom and kitchen. Low level w.c., wall mounted wash hand basin with splash back tiling, radiator. Double glazed window to rear aspect, two radiators, stairs rising to first floor, obscure double glazed door to rear garden. Double glazed window to front aspect, base units with work surface areas over, stainless steel single drainer sink unit with mixer tap over, spaces for washing machine and gas cooker, radiator, storage cupboard, doors to lounge/diner, bedroom three and hallway. Double glazed window to front aspect, wood effect flooring, built in wardrobe. Doors to bedroom one, two and bathroom, airing cupboard housing wall mounted boiler and hot water tank with linen shelves. Obscure double glazed window to front aspect, a three piece suite comprising a panelled bath with mixer tap over, pedestal wash hand basin, low level w.c., complementary tiling, access to loft void. 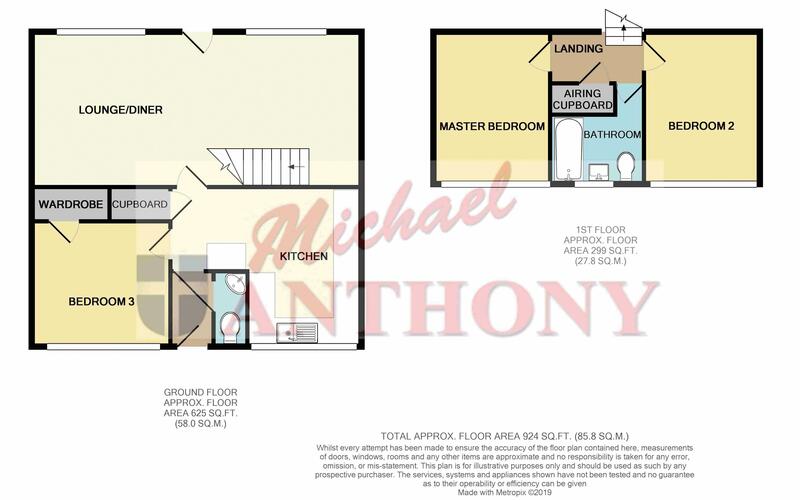 Fully enclosed by timber fencing, gated rear access, shed to remain, lawned area, outside light, patio area, decking area.